Magnetic variation (or declination) is a simple problem that can cause serious trouble when you try to find your way in the sky. How to deal with it? Ng – true north (geographic north), Nm – magnetic north, d – declination (in this case – eastern). Take a look at the picture above and imagine that you fly? As you can see – the compass needle points to about 30 degrees right (east) of geographical north. That means that if you flown according to compass – you would actually fly (true) heading of 30 degrees. To fly north you need to fly (in this case) magnetic heading 330. 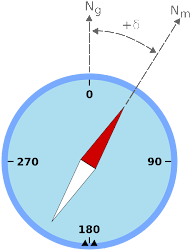 Magnetic declination or variation – is the angle on the horizontal plane between magnetic north (the direction the north end of a compass needle points, corresponding to the direction of the Earth’s magnetic field lines) and true north (the direction along a meridian towards the geographic North Pole). This angle varies depending on position on the Earth’s surface, and changes over time. Easy? If not, I will try to explain it in layman’s terms. I am sure you are familiar with the meridians and parallels grid. If someone says “north” – you naturally think about the point on top of the globe and a straight line that goes from your position to this point. The problems begine when you take a compass and look at it’s needle – where does it point? To the magnetic north – magnetic beeing a key word and a cause of all our problems. Magnetic north is displaced – it’s somewwhere in the Canadian Arctic – some 250 nautical miles from the geographic North Pole. To makes thinks worse – the magnetic south is even further from the geographic South Pole – it’s located somewhere on the Antarctic coast – south of Australia. The distance between magnetic and geographic South Pole is about 1500nm. It would take almost 4 hours to fly between them in an airliner! But this was not the worst part. Both magnetic poles are move and the lines joining them (something like the familiar meridians) are not straight. Do not be shocked when looking at the map below – it shows magnetic variation value in every place on earth. If you are in a place market with a blue “-10” line – it means that the compas points 10 degrees to west from where the north really is. Red lines (and positive values) mean that the compass points east from where the geographical north is. The green “0” lines show places where the compass shows the true north. Mind that I skipped the part about compass deviation or compass error. I also did not mention the magnetic anomalities. Let’s assume for the sake of this article that the compass has no errors. Variation – where to check it? On a charts showing a small area – a general information about magnetic variation may be shown in a single place – usually on the side or in the corner of the chart. Variation may be ommited on arrival, departure and approach plates or on other maps that show headings between navaids and fixes (like IFR charts). Magnetic headings and tracks are shown on this plates unless stated otherwise. Magnetic variation may have positive (eastern) and negative (western) value. 1. Magnetic variation has a value of 5° E (+5°). Magnetic heading 0° means 005° true heading. (0°+5°). 2. Magnetic variation has a value of 5° E (+5°) – again. Magnetic heading 183° means true heading 188°. 3. Magnetic variation has a value of 13° W (-13°). Magnetic heading 90° means true heading 77°. 90°+(-13°) = 77°. Remember to add when calculating true heading from the known magnetic heading and to substract when calculating a magnetic heading from a true heading. Most mistakes are made here! With practice you will be able to intuitively calculate both magnetic and true heading. 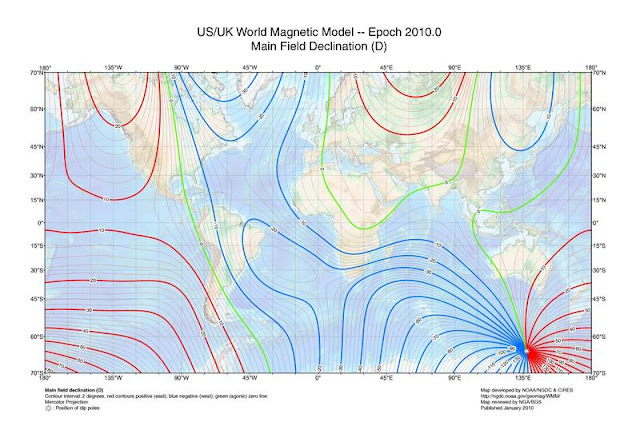 As I wrote earlier – magnetic variation changes because both magnetic poles move. That is why charts usually show the date when the variation was current and sometimes they may also show the annual change. It will look like this: 4° E, 2011, annual increase 0.2°. 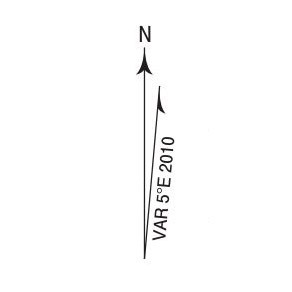 This means that in 2015 the variation value is 4.8° E. 5° E for navigation purposes. This information may be omitted on the charts that are updated often. Flight Simulator X uses 2005 magnetic variation. There are places where the change was no higher than 1.5 degrees but in some locations the difference may be higher. 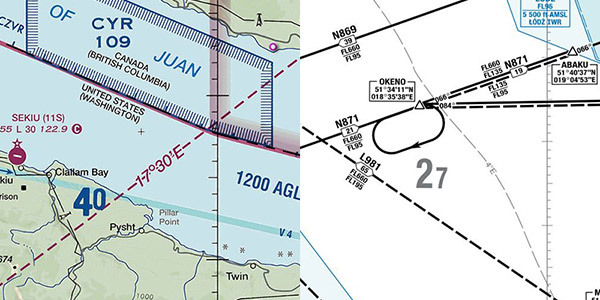 If you plan on doing a dead reckoning flight – this differences may affect your navigation. FSX Flight Planner uses FSX magnetic variation values so you can use it’s nav log to plan a flight (but it’s hard to work with both FSX flight planner and current charts as the headings will be slightly different). I use SkyVector.com to check magnetic variation. For every track current magnetic variation will be calculated. Unfortunately – there is a bug causing outdated airport declination to show for tracks originating at airport. It’s best to place a GPS waypoint next to the airport before planning the first leg.